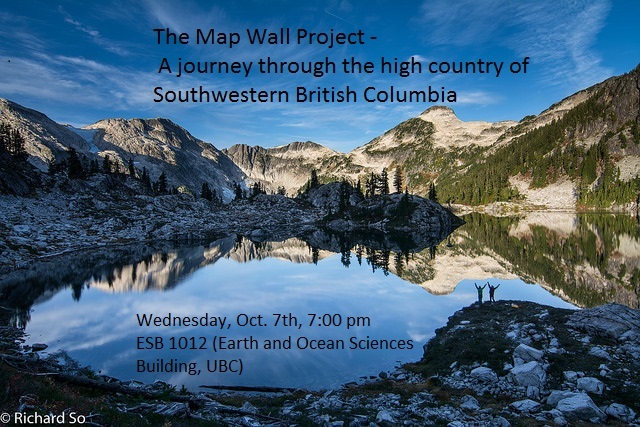 I'm doing a slideshow for the Varsity Outdoor Club at UBC, come check it out! Join Rich So as he presents some of his favourite trips in the high country of Southwestern British Columbia. Rich’s adventures of choice are long obscure mountain hikes, scrambles and ski trips to places ranging from the granite ridges above Princess Louisa Inlet to the open country of the South Chilcotin, the rarely visited summit of Mount Judge Howay and points beyond. Despite the enormous amount of suffering he puts himself (to say nothing of his unsuspecting trip partners) through, Rich always comes away with incredible photos of smiling, happy people and the wonderful terrain in our backyard. Born and raised in Vancouver, Rich So didn't discover the outdoors until university when he joined the Varsity Outdoor Club, where he learned to ski and climb. After a few years, he assembled two collages of topographic maps, collages that now cover his walls. Rich is out exploring the mountains around Vancouver on foot and by ski every chance he gets.